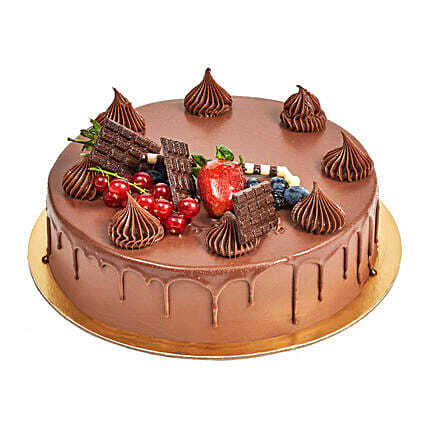 The chocolate fudge cake is made with a munificent amount of chocolate and thatas why sometimes it is also referred to as death by chocolates�. A simple chocolate cake is layered with chocolate icing and this would give your taste buds a heavenly happiness. "I really wondered about ur delivery .. its good success. Thank u Fernsnpetals. I hv one request only.. I paid money from international credit card.. I tried my SBI debit card to pay the money.. but couldn't.. So I have a request to u about the paying matter.. Pls accept National debit card for the purachase of international service ... Its my request only.. ok I really wondered about ur delivery .. its good success"
"Thank you so much for your great help and support. Just because of you it was really easy to make someone feel very special. I appreciate your overall assistance. Regards Harvinder Kaur"
"Black Forest the one I ordered the chips were broken. I am very very disappointed with fernsnpetals"